The town of Ypres in Belgium is one of the main names which the British associate with the Great War. The area around it was also known as the Salient. This region was fought over from October 1914 until practically the end of the war in November 1918. There were major battles here, including in 1917 the Third Battle of Ypres (often known as Passchendaele after the village). The map below shows main locations and villages in the Ypres area. The name Flanders was also often used for the region, a medieval state that covered parts of what are now Belgium and Northern France. For information on how to reach Ypres and where to stay, see Travelling to Ypres and Staying in Ypres. 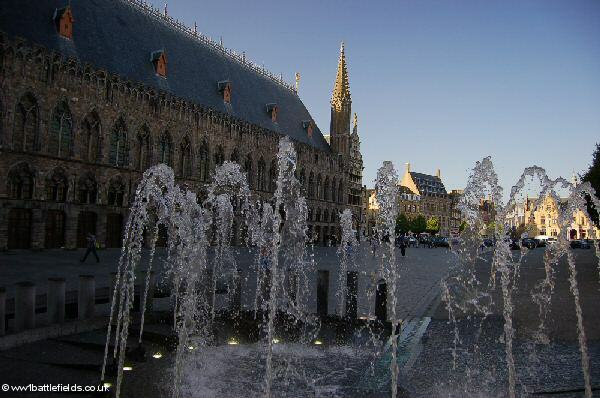 Ypres (now known as Ieper) is an ancient city with origins around a thousand years ago. 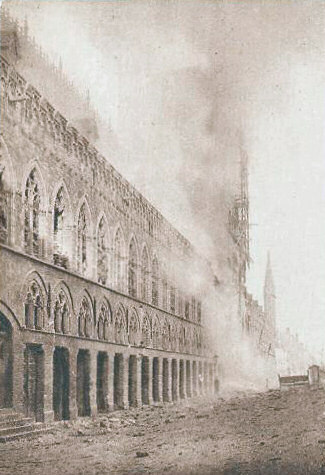 Despite being almost totally destroyed in the Great War, it was rebuilt, including the Cloth Hall (see pictures below). It is a pleasant and interesting city to visit in its own right, as well as the perfect base for battlefield exploration. Strolling around the ramparts after a day’s touring or walking is a very pleasant way to finish the day. See the Staying in Ypres page for more information on hotels, restaurants and other things to do and see in the city. There are an increasing number of tour companies which offer guided tours of the battlefields, including tours starting from the UK with operators such as Shearings Holidays and National Holidays. These can be a good way to get an introduction to the battlefields, with expert guides on hand to explain the ground and the sights you will see. Some local companies also offer full day and half day tours starting from Ypres. Great Rail Journeys offer battlefields tours by rail, a gereat combination if you enjoy rail travel. They have a tour which includes Bruges as well as the battlefields of Flanders (Ypres). Battlefield tours are not new by any means: the flyer below shows tours offered in the 1920s. The first guidebooks to the battlefields appeared in 1919! Major and Mrs. Holt’s Battlefield Guide to the Ypres Salient is the best guidebook for visitors to the area. For those with limited time it includes easy to follow itineraries covering the relevant sites. There is also a helpful map included with the book, and I still carry my copy every time I visit. For those with more time or who enjoy seeing the battlefields on foot, Paul Reed’s Walking Ypres is excellent. This provides a number of walks in and around Ypres, with clear directions, maps and detailed information on the Geat War related sites along each route. Other books that give some of the history and background to this area and the particular battles are Lyn MacDonald’s Passchendaele and The Sacrificial Ground by Nigel Steel and Peter Hart. Flanders Then and Now by John Giles has excellent pictures comparing the modern landscape with contemporary photographs. If you plan to walk or explore the battlefields in detail, then large-scale maps are extremely useful. For traditional paper maps the NGI (Nationaal Geografisch Instituut) series cover the area, using modern Flemish names (such as Mesen rather than Messines). Of course, there are also a multitude of online map platforms that can also be used via your phone (for example Viewranger). Ypres was a town of relatively little strategic importance, but it was fought over throughout the whole war. There was high ground which dominated this battlefield, to the north, south and east of the town. After the retreat from Mons, the First Battle of Ypres was fought in October/November 1914. Following this, trenches were dug and the area around Ypres ended up in late 1914 as a large salient, where the trenches of one side (the British here) jutted out into enemy territory. Salients were difficult to defend, as they were vulnerable to enemy fire from three sides. There was fighting around the town for the next four years. During 1918, firstly the Germans pushed forwards in their Spring Offensive (operation Michael), and then the British drove them back. During their advance, the Germans never quite reached Ypres, as the various Demarcation stones around the region show. Throughout the War, the Allies were determined to hold onto Ypres, and despite fierce attempts to take it, they did. Some of the original World War One Battlefields pages covering other sites in Flanders can still be found here, although they are being migrated to the new site format.